Here are some snazzy birthday facts about 25th of November 1968 that no one tells you about. Don’t wait a minute longer and jump in using the content links below. Average read time of 10 minutes. Enjoy! What day was my birthday Nov 25, 1968? November 25, 1968 was a Monday and it was the 330th day of the year 1968. It was the 48th Monday of that year. The next time you can reuse your old 1968 calendar will be in 2024. Both calendars will be exactly the same! This is assuming you are not interested in the dates for Easter and other irregular holidays that are based on a lunisolar calendar. There are 215 days left before your next birthday. You will be 51 years old when that day comes. There have been 18,412 days from the day you were born up to today. If you’ve been sleeping 8 hours daily since birth, then you have slept a total of 6,137 days or 16.80 years. You spent 33% of your life sleeping. Since night and day always follow each other, there were precisely 624 full moons after you were born up to this day. How many of them did you see? The next full moon that you can see will be on May 18 at 21:13:00 GMT – Saturday. Fun stat: Your first one billion seconds (1,000,000,000) happened sometime on August 3, 2000. If a dog named Squishee - a Flat-Coated Retriever breed, was born on the same date as you then it will be 245 dog years old today. A dog’s first human year is equal to 15 dog years. Dogs age differently depending on breed and size. When you reach the age of 6 Squishee will be 42 dog years old. From that point forward a medium-sized dog like Squishee will age 4.5 dog years for every human year. A massive undersea earthquake, estimated magnitude between 8.7-9.2, rocks Sumatra, producing a massive tsunami all along the Indonesian coast. Albert Einstein presents the field equations of general relativity to the Prussian Academy of Sciences. George Papadopoulos, head of the military Regime of the Colonels in Greece, is ousted in a hardliners’ coup led by Brigadier General Dimitrios Ioannidis. Suriname gains independence from the Netherlands. What does my birthday November 25, 1968 mean? 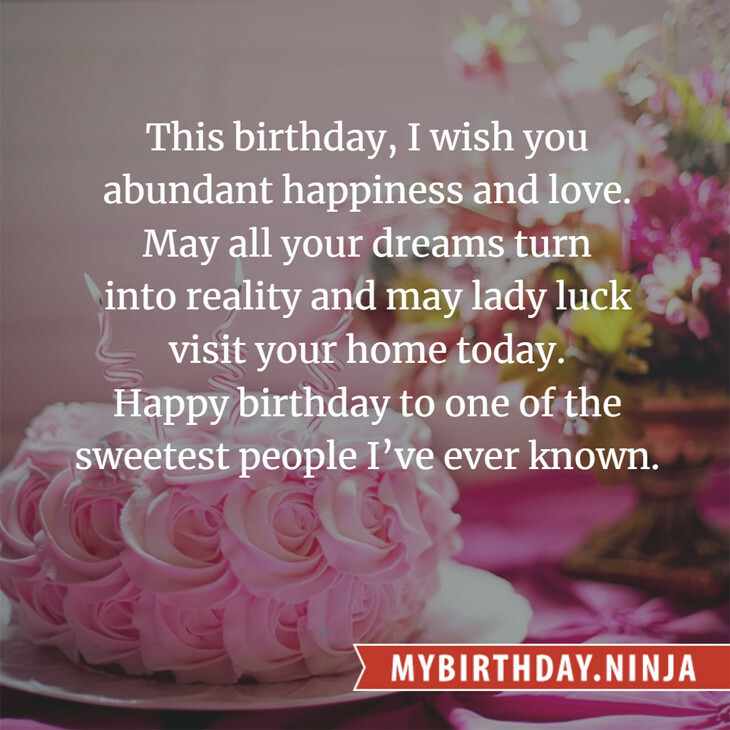 Your birthday numbers 11, 25, and 1968 reveal that your Life Path number is 6. It represents justice, nurturing and responsibility. You possess great compassion and seek to be of service to others. The following celebrities also have the same life path number: Rita Cadillac, Paul Morley, Paul Wickens, Andrew Garcia, Jimmy Thackery, Clive Owen, Miyuki Imori, Liselotte Pulver, Katy Garbi, Katie Lowes. 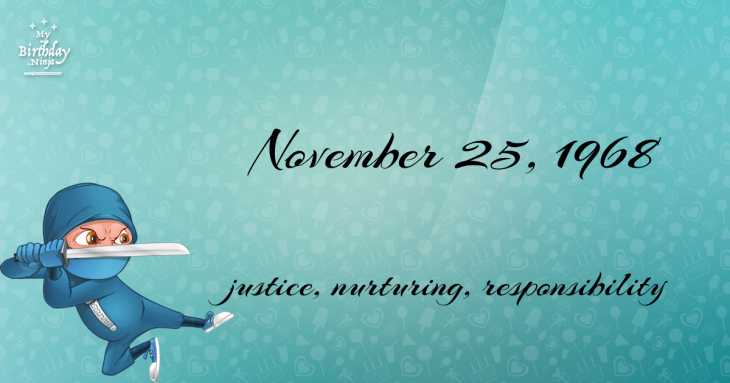 What is the birthday horoscope for Nov 25, 1968? The Western zodiac or sun sign of a person born on November 25 is Sagittarius ♐ (The Archer) – a mutable sign with Fire as Western element. The ruling planet is Jupiter – the planet of luck and expansion. According to the ancient art of Chinese astrology (or Eastern zodiac), Monkey is the mythical animal and Earth is the Eastern element of a person born on November 25, 1968. Fun fact: The birth flower for 25th November 1968 is Chrysanthemum for loveliness. What is the Love Match for Nov 25, 1968? When it comes to love and relationship, you are most compatible with a person born on January 17, 1996. You have a Love Match compatibility score of +217. Imagine being in love with your soul mate. On the negative side, you are most incompatible with a person born on July 4, 1951. Your incompatibility score is -168. You’ll be like a cat and a dog on a love-hate relationship. Arf-arf, I want to bite you. Meow-meow, stay away from me! The number-one hit song in the U.S. at the day of your birth was Love Child by Diana Ross & the Supremes as compiled by Billboard Hot 100 (November 30, 1968). Ask your parents if they know this popular song. I do not know how you feel about this, but you were a female ♀ in your last earthly incarnation. You were born somewhere around the territory of Southern Japan approximately on 600. Your profession was shepherd, horseman, forester. How many babies were born on November 25, 1968? Base on the data published by the United Nations Population Division, an estimated 120,171,727 babies were born throughout the world in the year 1968. The estimated number of babies born on 25th November 1968 is 328,338. That’s equivalent to 228 babies every minute. Try to imagine if all of them are crying at the same time. What is the popular baby name on 25 Nov 1968? Here’s a quick list of all the fun birthday facts about November 25, 1968. Celebrities, famous birthdays, historical events, and past life were excluded. Try another birth date of someone you know or try the birthday of these celebrities: September 26, 1930 – Fritz Wunderlich, German tenor and actor (d. 1966); November 18, 1924 – Les Lye, Canadian actor and screenwriter (d. 2009); April 28, 1984 – Toshiyuki Toyonaga, Japanese voice actor, actor, and singer-songwriter.